NORTHERN Ireland talks chairman Richard Haass has said his negotiations on dealing with the legacy of the Troubles will not be restricted by concerns already raised publicly by the British government. The Former US envoy will open the talks with politicians in Belfast on Tuesday, with the aim of brokering deals on parades, flags and emblems, and dealing with the past. There is already scepticism about the ability of the parties to compromise on the controversial issues that have been at the centre of the last 12 months of riots and political tension in Northern Ireland. But Dr Haass said he regards the end of this year as a “firm deadline” for the negotiations and he played down a row that has broken out between Secretary of State Theresa Villiers and Sinn Féin over the scope of any proposals he may make on dealing with the past, insisting his team will “proceed as we believe best”. Sinn Féin accused the government of setting parameters on the talks, after Ms Villiers signalled Downing Street would have concerns over any plans to deal with the past that were costly, left security forces open to undue criticism or involved public inquiries. Asked if he believed the issues raised by the Secretary of State placed constraints on him, Dr Haass said: “The short answer is no. I read the Secretary of State’s speech. I welcome getting her ideas as well as getting the ideas of others on this and the other agenda items, but no I don’t see this as setting boundaries. “I am an independent chair and will come at this with my own best take on things. At the end of the day the British government, the Irish government, the leadership of Northern Ireland itself – individuals and governments are going to have to decide what they are prepared to sign-up to, what they are prepared to support. “I read the speech carefully. It is good to know where the British government is coming from, where the Secretary of State for Northern Ireland, what she thinks. Despite concerns over the scale of the task he faces, the senior US figure who has brokered talks in trouble spots around the globe, predicted his work will not stretch beyond the current deadline of the end of this year. “My expectation is that it is a firm deadline. These issues are fairly well known. Between now and the end of the year I would think there is more than ample time to air the various positions and come up with potential compromises,” he said. “I am prepared to devote considerable time between now and the end of the year to help facilitate the process. Last weekend Secretary of State Theresa Villiers addressed the prestigious British-Irish Association Conference at Cambridge. She said she did not wish to pre-empt the Haass talks, but added that she was “mindful” of a series of issues on dealing with the past. She said: “Any mechanisms for dealing with the past needs to be fully consistent with maintaining the integrity of the rule of law, they must have regard to the fiscal position in which the UK government finds itself as a result of the deficit, and as our manifesto set out and the Prime Minister re-iterated in his statement on Bloody Sunday, we will never put those who uphold the law on the same footing as those who seek to destroy it. “For us, politically motivated violence from whatever side was never justified and we will not be party to attempts to re-write history by legitimising terrorism." The Secretary of State also questioned the future use of public inquiries, citing their cost, their ability to get to the truth and describing them as selective and potentially provoking “very divided views”. Sinn Féin President Gerry Adams later said the comments were an attempt by the British government “to try and set parameters for those entering the talks – it is an unacceptable intervention”. Dr Haass, who was speaking from New York ahead of his arrival in Northern Ireland, said he held an “extremely productive meeting” with First Minister Peter Robinson and deputy First Minister Martin McGuinness in the US earlier this week. And he also said he believed that Northern Ireland had made huge progress over recent years, but that the problems that are today disrupting the political process could be tackled. Dr Hass previously acted as a Washington envoy to Northern Ireland. 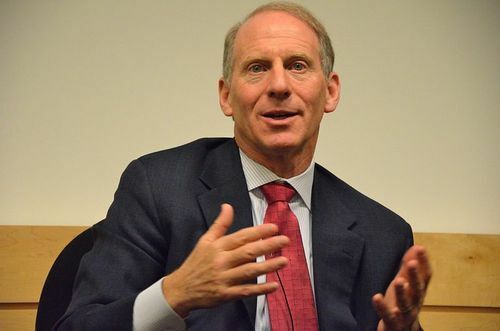 In 2001 under the administration led by President George W Bush, Dr Haass was chosen to play a key role in shoring-up the peace process after the suspension of the power-sharing government. In Northern Ireland he was seen at the time as a careful listener, but also someone who was a tough individual capable of being firm with those he believed were harming the efforts to restore political confidence. He currently heads a leading US foreign policy think tank, the Council on Foreign Relations, and has top level government experience representing the US in its policies around Iraq and Afghanistan. The talks he will chair involve all the main parties at Stormont and were born out of a series of initiatives unveiled in May aimed at reclaiming the initiative back from the streets, after months of disturbances sparked by a row over the decision to restrict the flying of the Union flag on Belfast City Hall. Disputes over parades have also been high on the agenda over the last year. The level of violence, the huge number of police officers left injured and the multi-million costs, have ramped-up the importance of the Haass talks. Earlier this year the Stormont parties compiled a list of high profile figures they hoped would act as independent chair of the talks. In June The Detail revealed Dr Haass was at the top of the list of preferred candidates, and he was subsequently confirmed to have accepted the post. His vice chair is Dr Meghan O’Sullivan, also a high profile figure who acted as an adviser to Dr Haass when he was envoy to Northern Ireland and who was previously an adviser to President George W. Bush. Their team will be in Northern Ireland next week and again for a week in October to gather opinions from politicians and interest groups, and they have even invited submissions to their website at panelofpartiesnie.com.